One of the dimensions to the current debate about Montgomery County’s Department of Liquor Control (DLC) that has not been empirically explored is its impact on the county’s restaurant industry. Restaurant owners have many complaints about DLC and some have said that entrepreneurs will not open new establishments here because of it. However, several urban districts in the county have lots of restaurants that seem to be doing just fine. So what’s going on? One of the many programs run by the U.S. Census Bureau is the Economic Census, a very detailed look at industries by geography that is updated every five years. Among the statistics collected by the Economic Census are the number of establishments, the sales of those establishments, and the number of employees. Below are the combined totals of two industry segments – drinking places (industry code 7224) and full-service restaurants (industry code 722511) – for 22 jurisdictions in the Washington-Baltimore region in 2012. This data does not include limited service restaurants (like fast food places) that often do not sell alcohol. 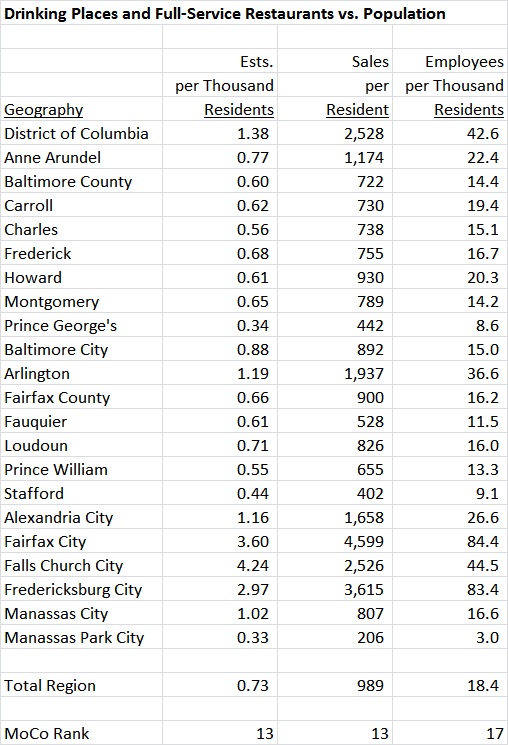 Data on drinking places for Fauquier and Stafford Counties and the Cities of Fairfax, Falls Church and Fredericksburg is not available because it does not meet the reporting thresholds established by Census. MoCo is a significant player in the region’s restaurant industry. It has 11% of the region’s bars and restaurants, 10% of sales and 10% of employees. But it also has 13% of the region’s population. MoCo matters because of its sheer size. What happens when the restaurant industry’s statistics are presented on a per capita basis? Using Census population data for the five-year period of 2009-2013, here’s what that looks like. In terms of establishments per thousand residents, MoCo (at 0.65) is not terribly different from the regional average (0.73). MoCo’s figure is also close to the two jurisdictions which most resemble it in education and income levels, Fairfax (0.66) and Howard (0.61). But on the next two measures, MoCo falls short. MoCo’s restaurant sales per resident ($789) are 20% below the regional average ($989). They are also below Fairfax ($900), Howard ($930) and Loudoun ($826). MoCo’s restaurant employment is just as bad. MoCo’s figure (14.2 restaurant employees per thousand residents) is 23% below the regional average (18.4) and lags most other places in the region, large and small. Why could this be happening? It’s not because of low income levels – MoCo does just fine on that measure as do many jurisdictions in the region. It’s not because of comparative tax burden. The District of Columbia’s Chief Financial Officer finds that MoCo’s tax burden is not out of line with its neighbors. Do MoCo residents simply not like going out to eat? Are we a county of shut-ins? In testimony before the County Council’s Ad Hoc Committee on Liquor Control, Frank Shull said poor selection, bad service and high prices keep Washington, D.C., restaurateurs from opening restaurants in the county. I own 2 restaurants in Montgomery County, both well known for the breadth of their beer, wine and liquor lists. The difficulty in creating and maintaining these lists because of the county controlled system is extraordinary. It adds hours of unnecessary labor to my payroll costs, diminishes the quality of my beverage programs through the inconsistency of stock, unavailability of products and errors in delivery, and drives up the cost of the products we sell–which must either be absorbed by us (therefore diminishing our profits) or passed on to the consumer resulting in higher menu prices. This system causes all but the most intrepid restaurant owners to dumb down their offerings because it’s far far easier and ensures Montgomery County will never compete with DC in terms of the quality and creativity of its restaurants. What would happen if MoCo’s restaurant industry were average in size relative to its population? 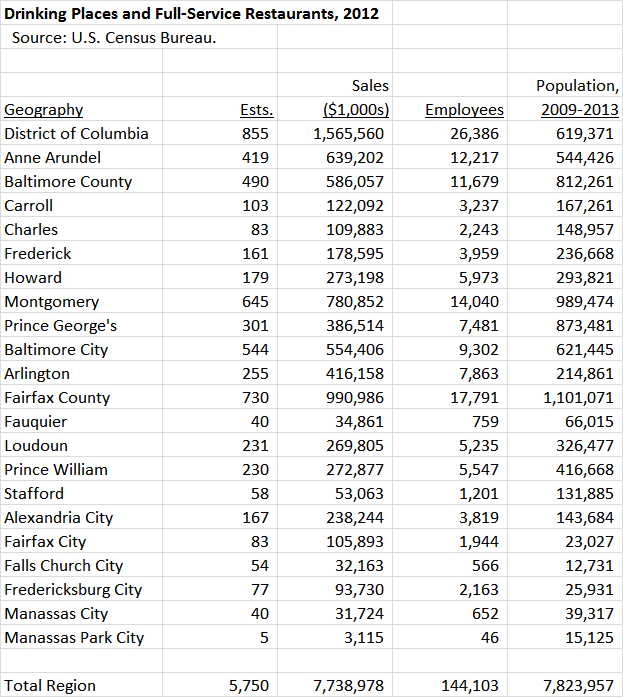 In other words, how big would the industry be if it had 0.73 establishments per thousand residents, $989 in sales per resident and 18.4 employees per thousand residents, which are the averages for the Washington-Baltimore region? Extrapolating from the data above, the county would have 82 more restaurants, $198 million more in sales and 4,184 more employees. All of this would create more tax revenue for both the county and the state. How do we get there? Let’s be honest and acknowledge that there could be many factors governing the size of the county’s restaurant industry and DLC is just one of them. But in the opinion of the folks who actually run restaurants, DLC is an important impediment to their doing business. The County Council has proposed reform, but in the opinion of the two largest alcohol distributors in the state, it won’t work and they won’t participate. Restaurants are not just businesses. They are critical cultural assets. People decide where to live in part because of the abundance and quality of food options. This industry is a large part of our quality of life. By unleashing its spirit of entrepreneurship, we enrich all of society. So how do we do that? Here’s one way. End the Monopoly.